This marker replaced an older "two post" marker dating to the 1960s. The Trout Rock Fort was one in the chain of forts that the Virginia House of Burgesses in March 1756 directed Washington to erect for the defense of settlers in the South Branch Valley. It also marks the end of Gen. Stonewall Jackson's pursuit of the Federals after the Battle of McDowell, May 12, 1862. 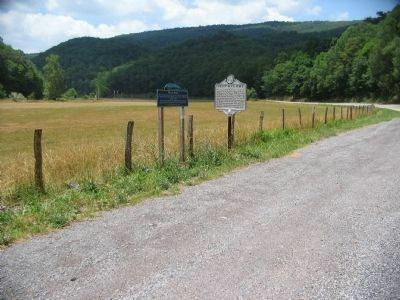 On this site during the War Between the States, gunpowder was made from saltpeter obtained in a nearby cave. Erected 2009 by West Virginia Archives & History. Location. 38° 36.197′ N, 79° 22.267′ W. Marker is near Franklin, West Virginia, in Pendleton County. Marker is on U.S. 220 0.1 miles east of Powder Mill Road (County Route 220/8), on the right when traveling east. Touch for map. Marker is in this post office area: Franklin WV 26807, United States of America. Touch for directions. Other nearby markers. At least 8 other markers are within 6 miles of this marker, measured as the crow flies. Destruction of Saltpeter Works (a few steps from this marker); Confederate Prayer Service (approx. 1.7 miles away); Devonian Shale (approx. 1.9 miles away); McCoy House (approx. 3.4 miles away); Pendleton County World War I Memorial (approx. 3.4 miles away); Franklin (approx. 3.4 miles away); Stone Cemetery (approx. 5.6 miles away); Murder of Ambrose Meadows (approx. 6 miles away). Touch for a list and map of all markers in Franklin. More. 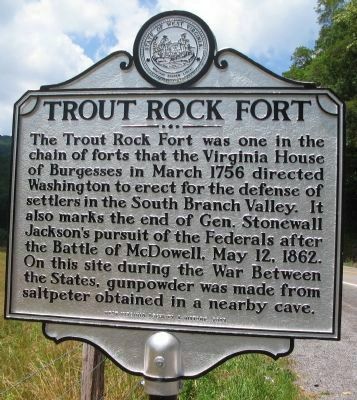 Search the internet for Trout Rock Fort. Credits. This page was last revised on June 16, 2016. This page originally submitted on August 17, 2010, by Craig Swain of Leesburg, Virginia. This page has been viewed 858 times since then and 8 times this year. Photos: 1, 2. submitted on August 17, 2010, by Craig Swain of Leesburg, Virginia.